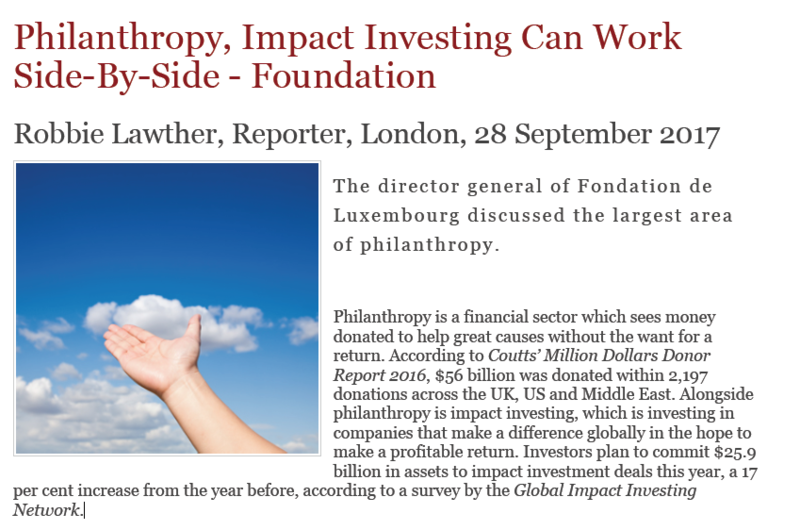 Despite the differences in philanthropy and impact investing, Tonika Hirdman, director general of the Fondation de Luxembourg, which was created in 2008, says the industries can work together. Philanthropy is a financial sector which sees money donated to help great causes without the want for a return. According to Coutts’ Million Dollars Donor Report 2016, $56 billion was donated within 2,197 donations across the UK, US and Middle East. Alongside philanthropy is impact investing, which is investing in companies that make a difference globally in the hope to make a profitable return. Investors plan to commit $25.9 billion in assets to impact investment deals this year, a 17 per cent increase from the year before, according to a survey by the Global Impact Investing Network.